From as far back as I can remember I would sit and watch my dad make dinner. (To this day I still LOVE watching people cook) And even as an adult when I would go over to my parents for dinner I would still hover in the kitchen while he cooks. Because of his job he would make dinner every third week and on the weekends. Sometimes we’d go days without seeing each other. Those times however we’d draw pictures and leave them for one another for when we’d get home, or woke up. Once he even got us a HUGE roll of paper and we added to the same picture creating a confusing jumble of doodles…faces, leaves, trees, birds. 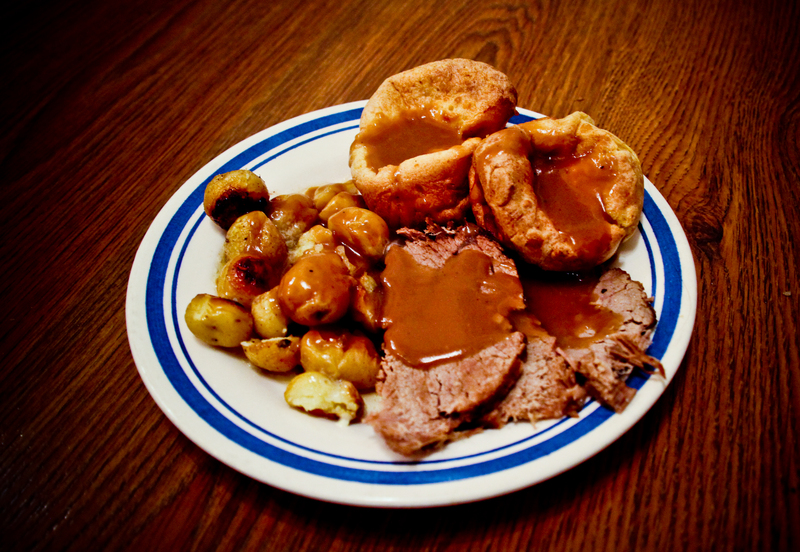 Just like a lot of families we had a dinner routine and every second weekend we’d have roast beef, double baked potatoes, yorkshire pudding (it always looked so complicated) and lots and lots of gravy. My dad is an excellent cook and it was always fun to sit in our white and red (it was the 80’s) kitchen up on the bar stool yammering on about whatever nonsense a little girl chats about, watching him without a recipe put together everything. Always perfectly timed and never burnt (that’s how I remember it anyway). Certain things he made seemed incredible, almost magical back then. I remember him making my mom Crêpe Suzette. At the time I didn’t know what it was but, I was floored! To this day I remember the gitty excitement when he lit it. Another time I was the cinnamon and sugar shaker when he made doughnuts (My most favorite cooks helper job as a kid). You’d think after years of watching him cook I’d be better than I am…. Now looking back, I don’t think I was actually paying attention to the food. It was him I was watching. It feels like forever since the last time I saw my dad cook. A couple of days ago I asked him to show me how to make Yorkshire Pudding (and it just so happens it would have been the second Sunday). DO NOT OVER MIX! – Lumps are good! *NOTE: Once they are baking… DO NOT OPEN OVEN DOOR! DO NOT BANG STOVE! KEEP ALL KITCHEN ACTIVITY QUIET! They turned out PERFECT (not surprised)!